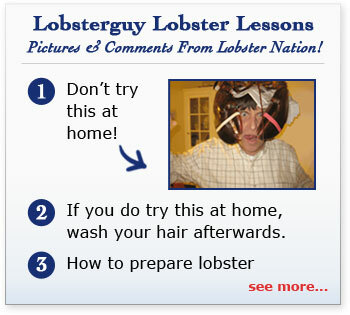 Home > LobsterGuy Gift Certificates! 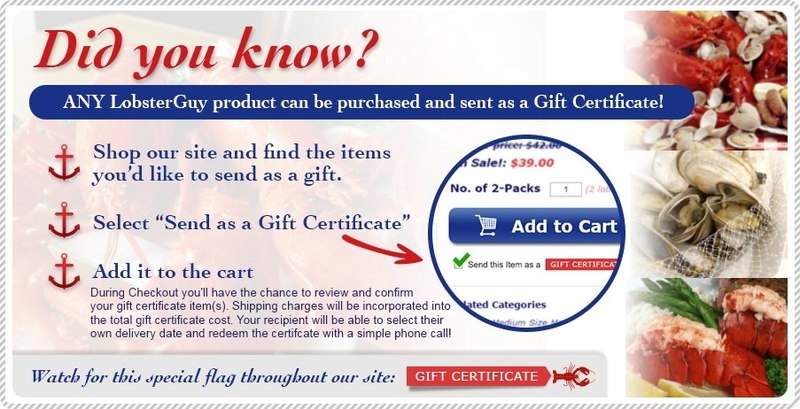 LobsterGuy offers both E-Gift Certificates and Mailed Certificate Packets! These Are A Great Gift Idea For Anniversaries, Birthdays, Graduation Gifts or for any Special Occasion! Our E-Gift Certificates are perfect for your tech-savvy relatives and friends! Your recipient will receive their own personalized gift certificate and code and a personalized message from you via email directly from You! Our Mailed Gift Certificate Packages come with our full color brochure, along with a hand written personalized card from You! Don't forget to Order mailed Gift Certificate packets Early around the Holidays! Pressed for time and want something fast as a last-minute, outstanding "Over the Top" gift? We gotcha covered! Order an E-Certificate sent to yourself; download and print the form here: click here; use the emailed details to fill out the certificate; and then hand deliver! All LobsterGuy Gift Certificate options are conveniently listed below! Perfect for your tech-savvy relatives! These are wicked popular around the Holidays! e-Certificate Codes are redeemable online, year-round, and do not expire! Your LobsterGuy Mailed Gift Certificate Packet can be mailed to you To Give As A Gift, or mailed directly as a Gift to your recipient! Whatever You Choose! Mailed Gift Certificate packets including the gift certificate, a hand written personalized greeting card with your message, redemption instructions,and a LobsterGuy brochure that has all our cool stuff in it! Mailed Gift Certificate are redeemable over the phone, year-round, and do not expire! All they have to do is call us to redeem!